The aptly named “Three Rondavels” are a trio of circular mountaintops resembling the traditional African dwelling of the same name – “huts” which are made up of circular walls, adorned with a cone-shaped thatched roof. 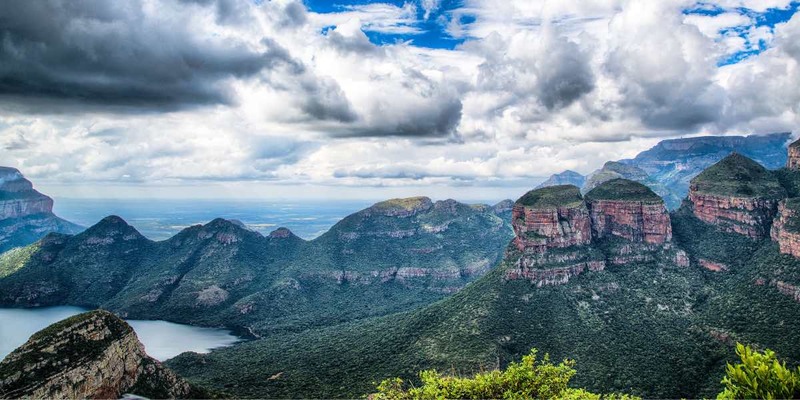 Also known as the “Three Sisters,” each of the peaks is named after the most problematic of ex-local Chief Mashile’s wives, namely Magabolle, Mogoladikwe, and Maseroto. Behind the Three Rondavels is the highest peak in the Mpumalanga stretch of the Drakensberg. Standing at 1,944 metres above sea level, the mountain top is named after Chief Maripe, who successfully fended off attacks by groups from Swaziland after fleeing to the mountains with his tribe in the 19th century. The outlook point from across the canyon supplies unsurpassed views of all four peaks as well as the Swadini Dam and the dramatic cliff-drops down the length of the canyon.